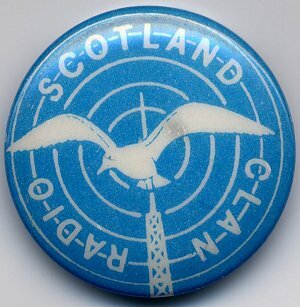 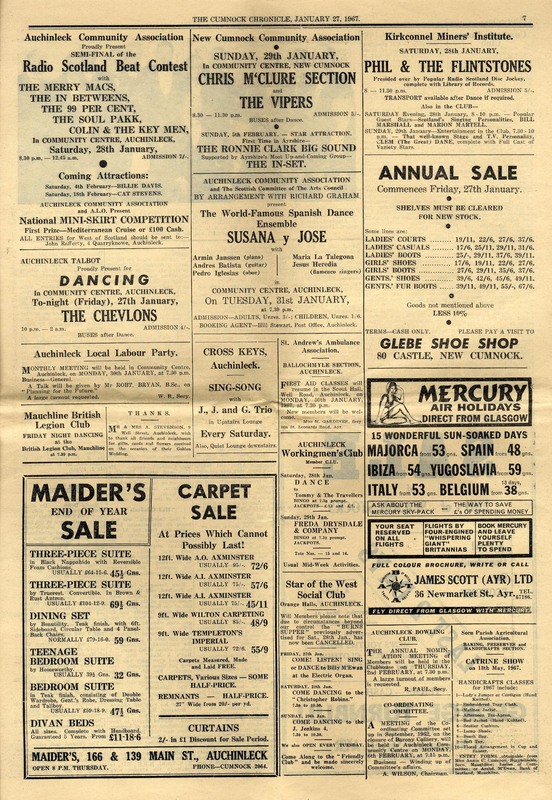 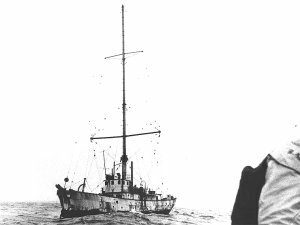 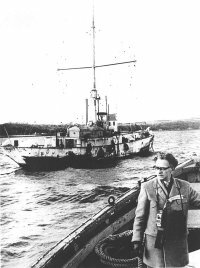 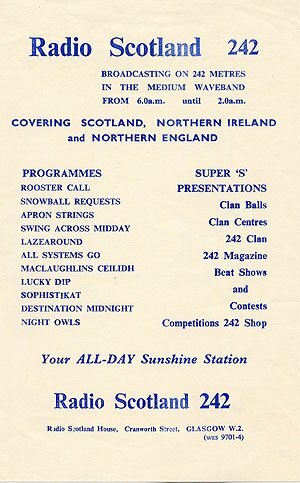 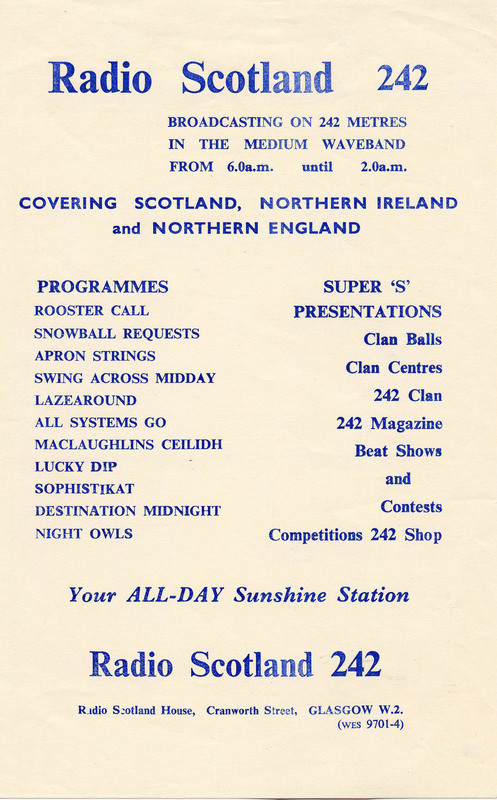 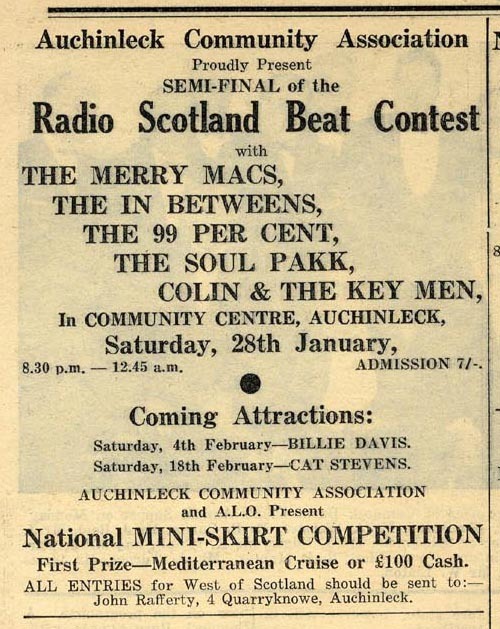 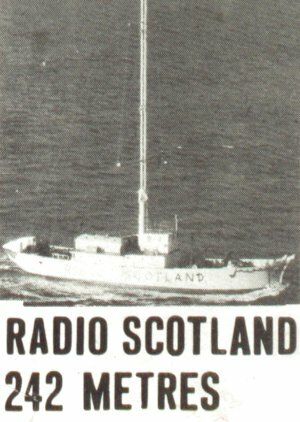 The Radio Scotland memorabilia on this page comes from various sources, including Ian Biggar's large collection of historical radio material. 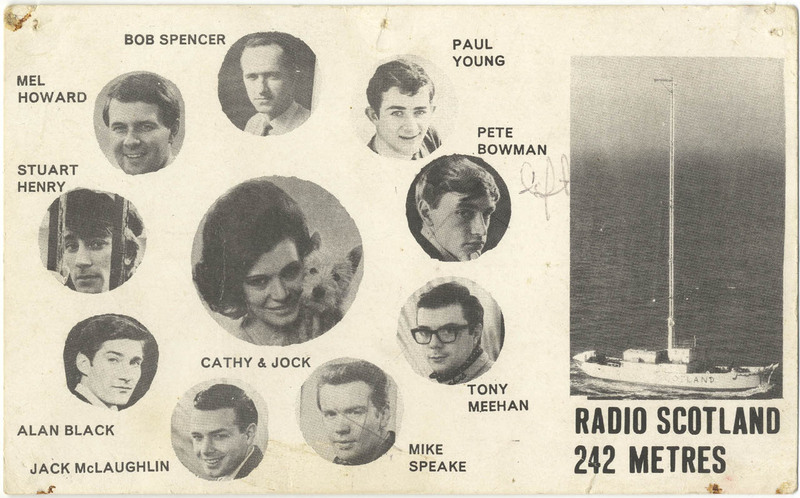 Items also came from Andy Walker, Richard Crichton, Brendan H, and Paul Rusling, and the Pirate Radio Hall of Fame. Thanks for sharing chaps. 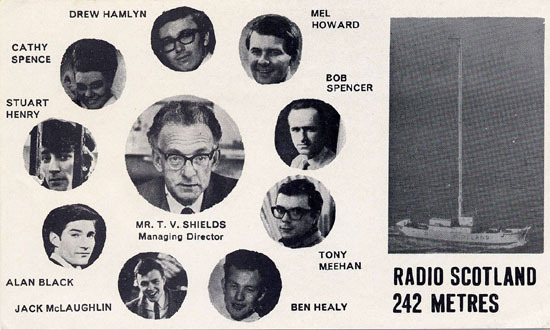 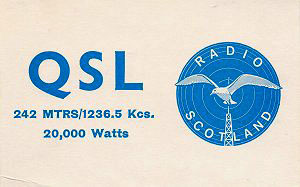 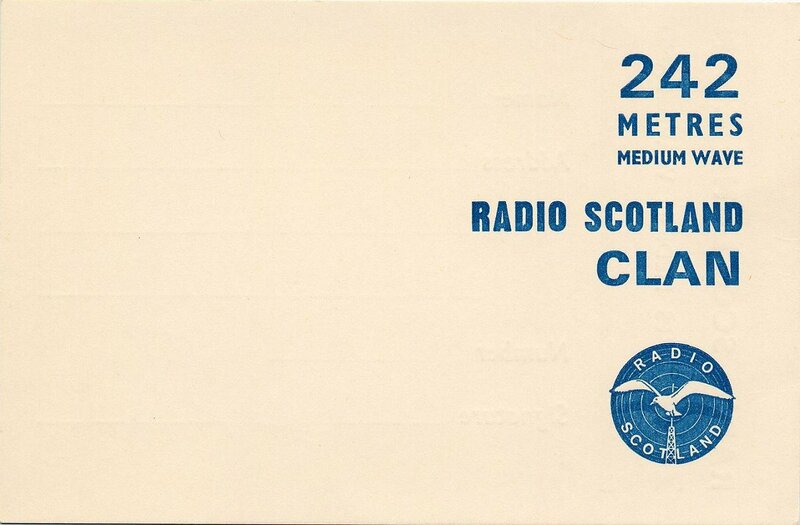 A Radio Scotland clan membership card, supplied by Ian B. 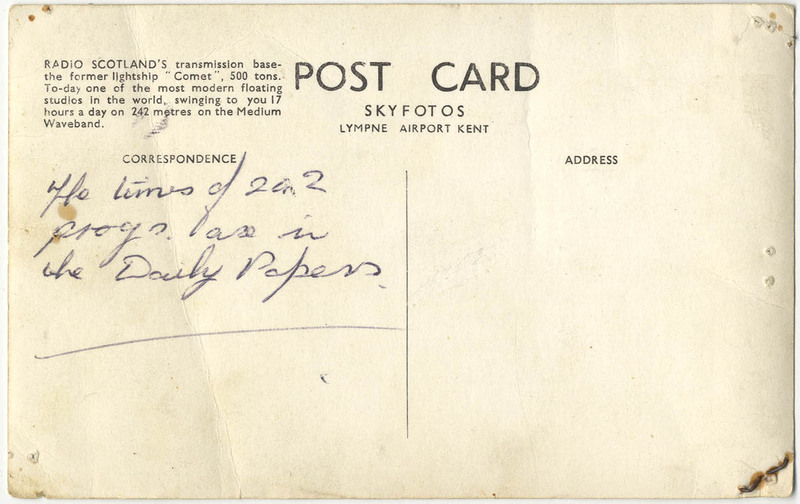 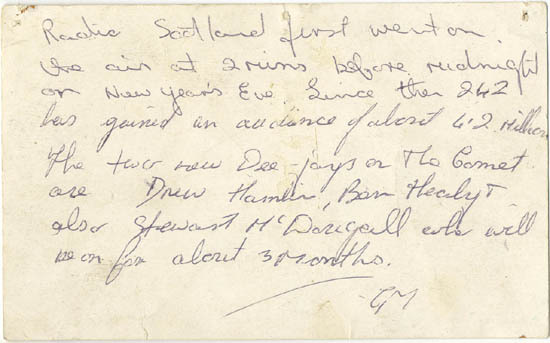 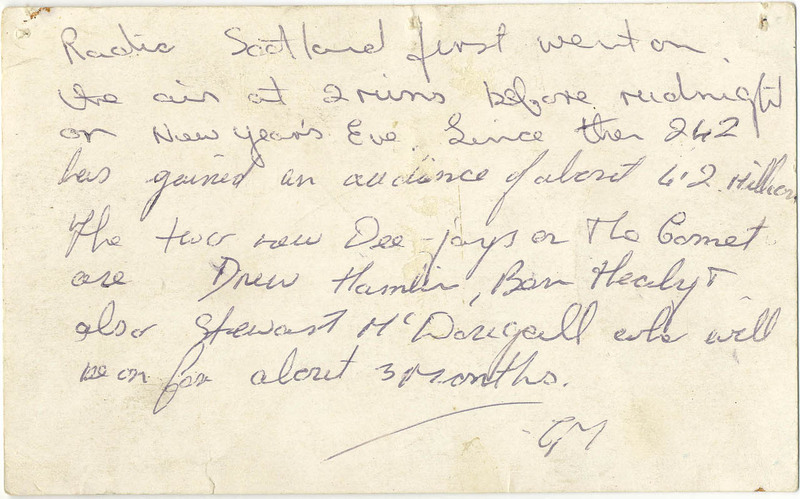 Above, a card from the collection of Ian Biggar. Below is the front and back of a different card supplied by Andy Walker. 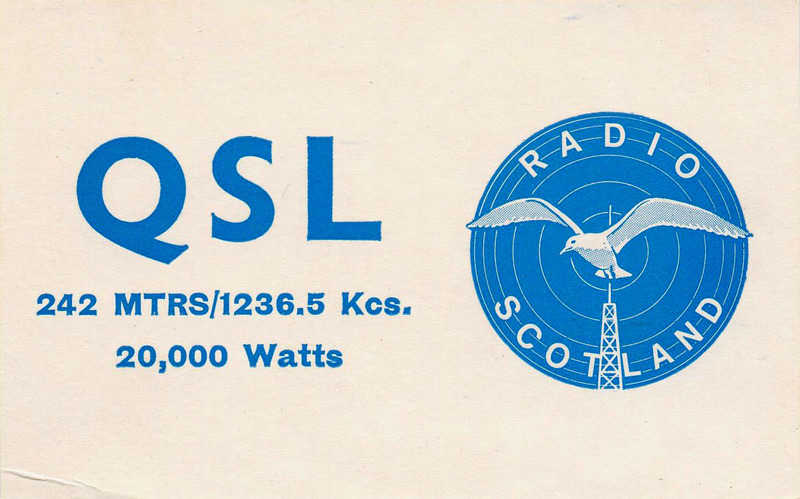 Click on the link below to download a full scan, 600dpi of the second card. Full res scan of the above card front. 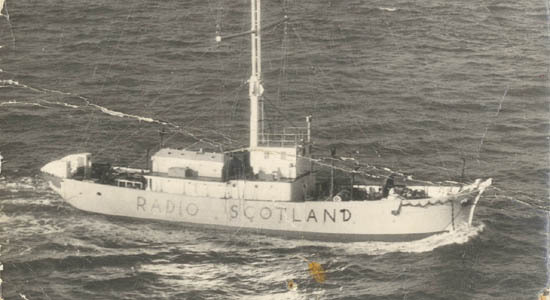 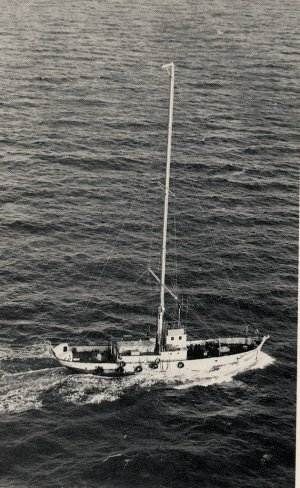 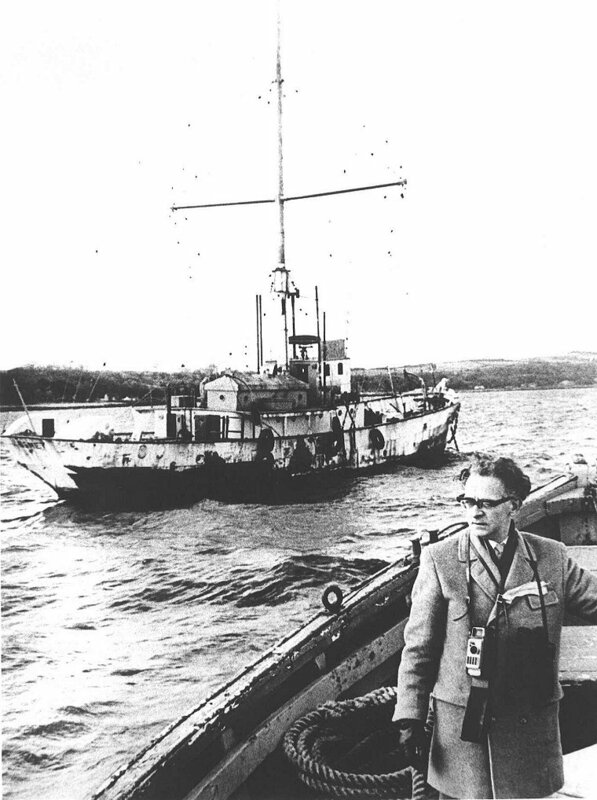 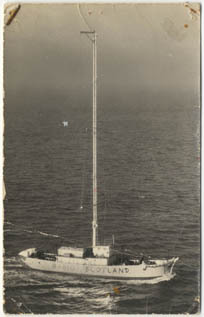 A couple of view of the Radio Scotland 242 ship, the Comet, left image supplied by Ian Biggar, and right image supplied by Andy Walker. 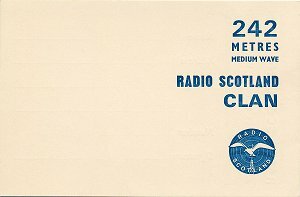 The right hand image is so clear we have also uploaded a high res version that will print out nicely in A4 or even larger. 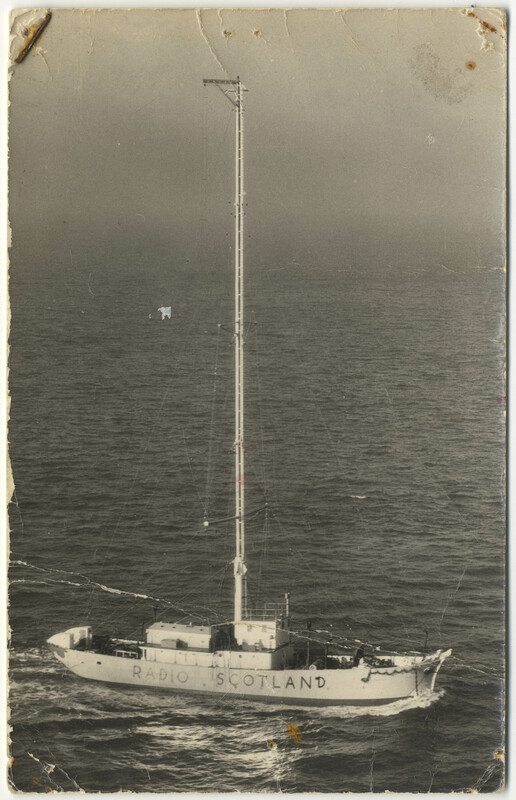 Below are a couple of samples of the image, a close up of the ship only, and a view of the "gallows" at the top of the tower, and the back of the card..
Large scan of the Comet, 600dpi scan, 692k. 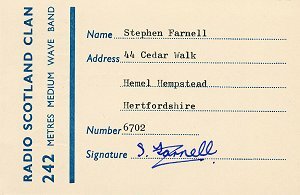 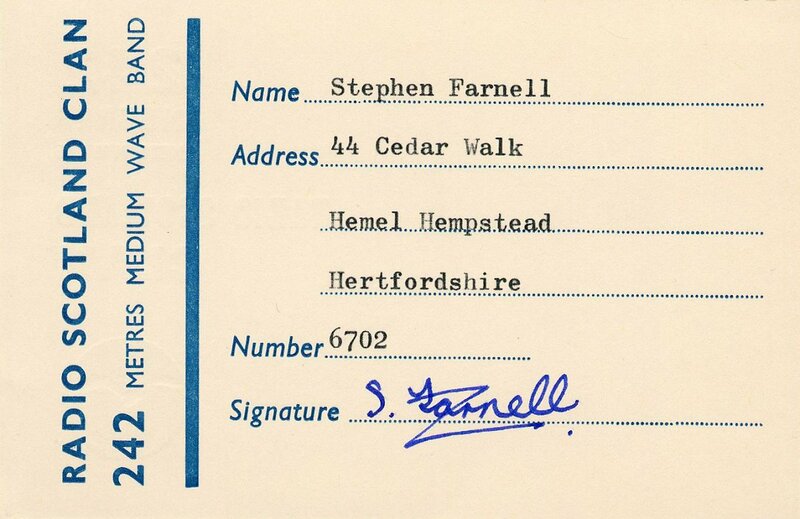 Card left in original condition.